Saturday afternoon proudly declared that Sunday was going to be even more sleepy and droopy-woozy-gloopy. It was almost six in the evening and I just couldn’t wait to wrap-up all the drawings and samples and rush home to sleep through the weekend. Two feet away from me, Kunsh slept snoring softly and clutching his stick (constructed painfully out of straws) and I was surprised to find myself envying a little child. Saturday evening went by softly, with a quick visit to one of our favorite coffee hangouts, Mocha. Fauri and I went back home excited about all the lazying around that we were sure was awaiting us. Don’t know what went wrong, but we woke up to the doorbell. The maid. The gardener followed in an hour. The neighbor came up for help another hour later. The watchman. The newspaper guy’s assistant. The cable guy. So much for sleeping through Sunday. Finally, I decided that chopping mushrooms would let out some of the irritation. And I was right. In the end though, I made a simple, super-easy lunch of pan-seared chicken (for me) and aloo ke parathe (for Fauri), before we headed out to catch Monsters vs. Aliens at Fun Cinemas. Very grown-up, I know. Earlier last week, we got a mound of button mushrooms and had used up most of them in two very high-calorie batches of pasta and a mushroom risotto. And we’re still left with a small box. Well, not anymore. – Half a cup of chicken stock or water, this is optional, depending on the kind of consistency you want your sauce to have. – Heat oil and sear the chicken till brown. Do this in batches, depending on the size of your pan/skillet. – Remove from the pan. In the remaining oil, add the chopped scallions, garlic, bay leaf and peppercorns and saute till soft and translucent. Alternatively, if you’ve pureed the scallions, saute the garlic, bay leaf and peppercorns for about a minute on high heat and then add the puree and cook till the mixture turns slightly golden brown. 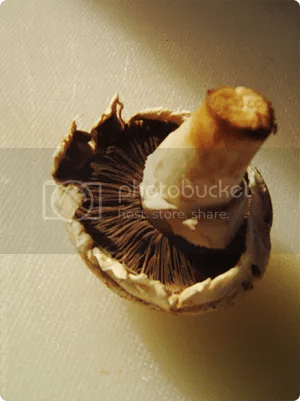 – Add the mushroom. 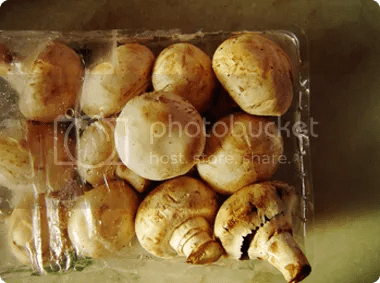 Lower the heat, cover and cook till the mushrooms become spongy. – Add the white wine and basil. – Wait till the alcohol evaporates. Then add the cream and ultimately season with salt, sugar and pepper to taste. – Cover and cook till the mixture comes to a boil. – Add this point, is the sauce seems too thick, add half a cup of chicken stock or just plain water,or more till you get the consistency you like. Cook for another 5-10 minutes. – Add in the seared chicken pieces and toss lightly. – Take it off the heat. 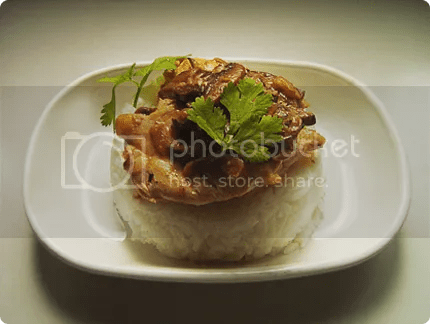 Garnish with cilantro leaves and serve with steamed rice. Foram’s parathas were a little more spicy than I would have liked them to be….but yummy all the same! Peel and boil a couple of big potatoes. Mash them when cool. Heat a little oil in a skillet. Fry chopped red onions with ginger-garlic paste. Add in the potatoes and season. Meanwhile mix water and flour together to form a soft and springy dough. Divide in equal-sized balls. Roll out in circles. Place a handful of potato filling in the middle. Wrap the edges of the rolled out dough on top of the filling. And carefully roll out the stuffed ball again. 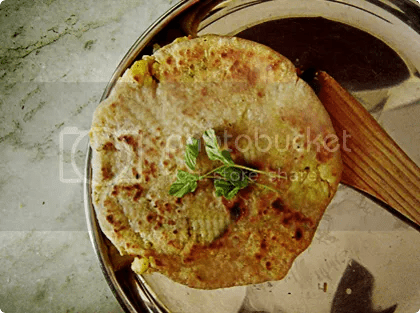 Heat a little oil in a flat pan (tava) and place one of the stuffed parathas on it. Turn about a minute later till both sides are golden brown and the flour is cooked thtough. Serve hot with mint chutney or chilled cucumber raita. We bumped into your blog and we really liked it – great recipes YUM! YUM!. I can taste those mushrooms — I like sliced, but I also like just quartering them, so there’s plenty of mushroom flavor in each bite. I like how you justify each ingredient in your recipe. This is a pretty dish, and it looks very tasty! mmm i’m going to try the paratha one and make some palak paneer. yummy! that recipe for chicken in mushroom sauce is precisely what i am craving at this exact moment!